Okay friends. When I find something amazing, I just have to share it. Over the next 2 months I'm going to tell you about some of my favorite eco friendly, functional items that would be super easy to incorporate into your everyday life, and could easily last you a lifetime. Today, I’m so excited to finally get to tell you all about my new Traveler’s Notebook! We were sent this beautiful traveler’s notebook from our friends at Goulet Pens, who by the way, carry some of THE BEST fountain pens, planners and stationery! I’ve had my eye on the Traveler's Notebook for awhile, and I’ve watched way too many videos online about different ways to use them and set them up. You already know I’m all about simplifying so I’m going to show you how you can turn a Traveler's Notebook into your planner, travelers notebook, journal, sketchbook, wallet, and more! 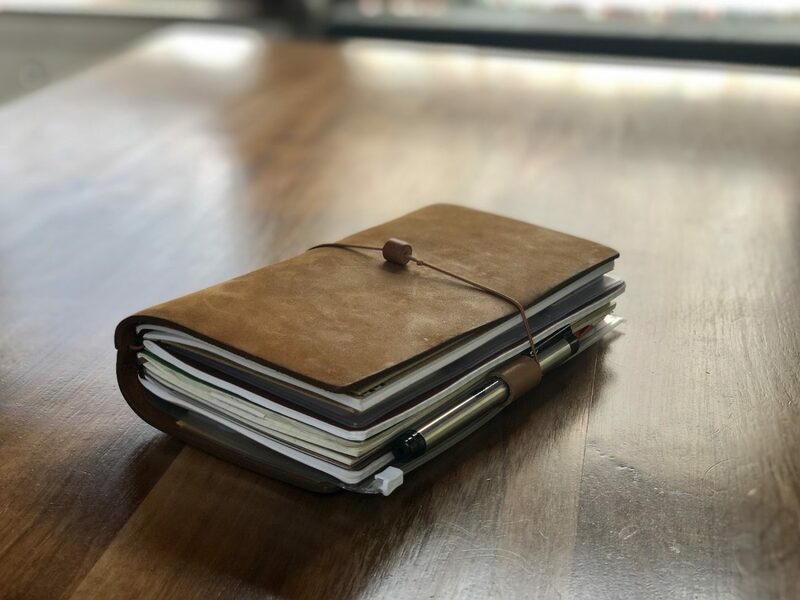 If you’re not familiar with what the Traveler’s Notebook is, it’s essentially a leather flap with an elastic band down the middle that allows you to add different inserts depending on what you want to use it for. The plastic pockets you see on the inside are extra little accessories I added for functionality and I'll talk about those a bit later. It also has an elastic band that comes out the back so you can stretch it around the notebook to keep everything nice and secure when shut! It sounds so simple, right? And it is, but most importantly this is a product that can literally last you your lifetime! We’re always looking for quality products that are super functional, eco friendly, and something we’d be proud to show off. The Traveler’s Notebook checks all the right boxes! If you look on YouTube you’ll find several different ways people are using the TN, but to be honest a lot of them were a big turnoff for me. I don’t have time to ‘scrapbook journal’ my way through the week, but I want to stay organized and remember fun things we did on our travels. The size of this traveler’s notebook is perfect for me. It fits in my bag easily, but is still big enough for me to actually easily see what I’ve got going on, but if you're looking for something smaller they also have a passport size! The interchangeable inserts are genius. You can have as many as you want, though personally I think it feels a little too chunky for carrying around everyday if you add more than 5 inserts. So, let’s dive in shall we? I’ve only had my Traveler's Notebook for about a month, but I’ve been constantly fine tuning it according to how I will use it best. I think I finally have a system down that works for me. There are so many inserts to choose from but I’m just going to touch on the ones I have. The most important two inserts for me are the monthly and weekly calendars, hands down. What I love about them is they are not pre-labled with set months and years. You get to write it in yourself. I love this for many reasons, but mainly because if you’re changing planners in the middle of the year you’re not loosing half of the functionality of your planner! You can start and stop your planner any day or month! Genius! There is plenty of room for writing all of your tasks on left side where the dates are, and that grid on the right? Perfect for adding a checklist of things to accomplish during the week. Plus you’ll likely end up with some extra space for doodles, stamps, stickers or memorabilia of where you were that week. Since I’m using this Traveler's Notebook as my planner and wallet, I always have it with me while we adventure to new places. When we visit National Parks it’s easy to whip it out and stamp it at the Visitor’s Center! This will be so great for looking back at and remembering all that we did throughout the year. I guess it’s kind of the lazy person’s version of a travel journal! Hey, I like to keep things simple, but I do love to look back and remember what we did that day. Another insert I have is the blank notebook. Although I haven’t used it as much as I would like to, it’s really nice to have when I hear a quote I want to remember or get inspired to draw something. I’m no artist, but I am a doodler. And sometimes it just nice to have that extra sketch paper when inspiration hits! The grid insert is awesome! I didn't know how much I loved grid paper until I started using this! This one has several things we need to remember like our pre-workout measurements, mile counter, details of projects we’re working on, lists of places we want to visit, and tasks we need to accomplish. I do have a lined notebook insert, but I’m saving it for when my grid insert is used up. I originally put all the inserts in here but it was just a little too chunky for everyday use for me. I love the setup I have now. In my traveler’s notebook I also opted for a Kraft Folder! I have it wrapped around my sketch notebook in the picture. It has come in handy for things like receipts or brochures or postcards we pick up along the way. It’s always best to have a few extra pockets, right? I got this plastic zippered insert mainly for the zipper pouch. It’s nice to have stamps, stickers, pens, and little things with me that need a place to stay. Plus a few extra bucks in there too for emergencies. The other side of this is one long pocket. These little insert accessories wrap around notebooks easily so you don't have to use as many rubber bands to add to your notebook (check youtube for more videos). The other plastic insert is for cards, and I honestly can’t decided if I like it or not. It's a great idea if you're wanting to use your Traveler's Notebook as a wallet, but know that the plastic pockets tend to stretch and you need like 5 cards per slot to keep them in place. After using this insert for awhile, I took it out a few days ago. I am keeping it though in case I decide to add it back in. I was playing around with the wallet aspect of the TN and I found that I could easily just insert my existing wallet and that way it’s easily removable since it’s just held in there with the elastic band! This may be a better solution than the plastic insert. Oh, and a couple little other things that I love and highly suggest you grab...the set of extra elastic bands! You'll need this if you're adding more than 2 inserts to your notebook! Check on YouTube for so many videos of different ways to connect your notebooks. And I LOVE these plastic pocket stickers. I wasn't sure if they'd work well, but they are stuck and they're not going anywhere! There's no such thing as too many pockets! Of course there are so many other accessories you can add to make this fit your personal journaling needs. Goulet Pens has so many options and their customer service is top notch. Check out their website for more options for your traveler's notebook! While we’re talking about planners and eco friendly options, let me tell you about something I just tried out. Before we were sent the Traveler's Notebook, I looked into our drawer where we keep pens and pencils and I was so frustrated that we had SO MANY PENS! And I grab one and it’s out of ink, grab another…also out of ink! That got me thinking, what if we just switched to fountain pens? At this time we were in the middle of nowhere Wisconsin where there were exactly zero stationary or art supply stores. However, one trip into Walgreens and I found a fountain pen! I’ve never used one, but I love the idea of keeping one pen and refilling it with ink when it runs out. Less waste is always a good idea! The sweet folks at Goulet Pens sent me a couple fountain pens to try and I’m hooked! How cool will it be to have the same pen for years to come and just refill it with the ink color of your choice? Why have I never thought of this before? Make sure you check out Goulet Pen's selection of fountain pens, and watch a few of their videos. I love how passionate they are about their supplies. Anyway, I’m all about simplifying and between the traveler’s notebook and fountain pens, I have exactly zero plans to research any other planners or pens!